Ultimate CHEWY Chocolate Chip Cookies are big, thick, chewy, soft in the middle, crisp at the edges, and loaded with chocolate chips! 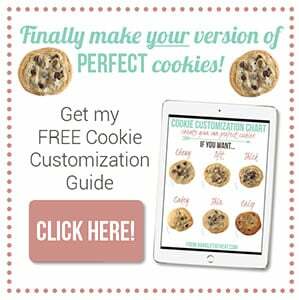 Download my FREE Cookie Customization Guide! Taste: Big butterscotch flavor without being too sweet. These cookies taste like what you imagine a chocolate chip cookie should taste like! Texture: The best part! These babies are big, thick, super chewy yet soft on the inside and crisp at the edges. When they’re fresh from the oven the chocolate is all warm and gooey. Perfection!!! Ease: Very easy, though I do use two different flours and there is a chilling period so patience is involved. You can make a double batch, shape the dough into balls, then freeze the balls. 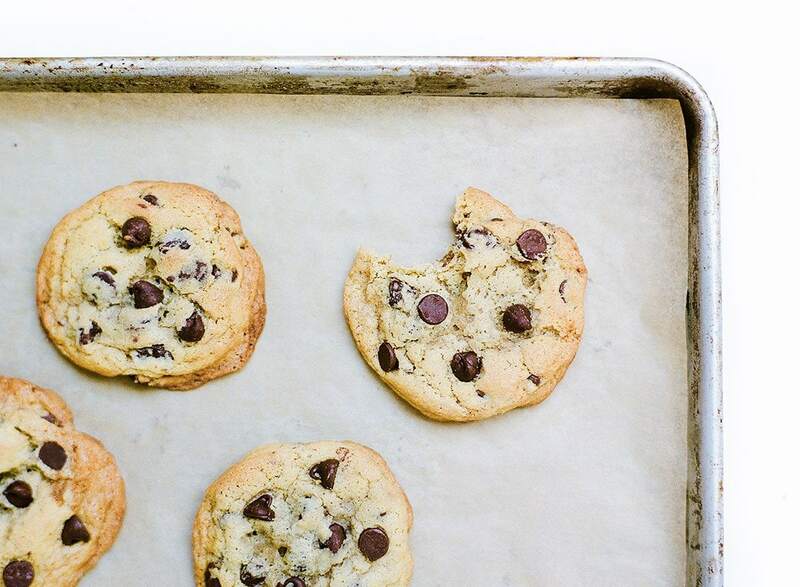 Defrost and bake when the cookie craving comes! Appearance: A stack of these cookies would turn anyone into the cookie monster. Pros: My all time favorite cookie recipe. Would I make this again? A thousand times yes, I’ve made this recipe a handful of times already and have extra dough stashed in the freezer at all times. I‘m super duper excited to share with you my version of the Ultimate Chewy Chocolate Chip Cookies complete with a video to show you exactly how they’re made. This is a perfect recipe to learn some of the basics of the science of baking because with cookies it’s so easy to see how different tweaks impact the final result! Be sure to check out my Ultimate Guide to Chocolate Chip Cookies before you make these! You may be asking yourself, what makes this recipe the “ultimate?” Well, let me tell you. I’ll start with flavor because these cookies have HUGE butterscotch flavor and that is exactly what I adore in a chocolate chip cookie. Beyond the flavor is the texture, which is nothing short of incredible. 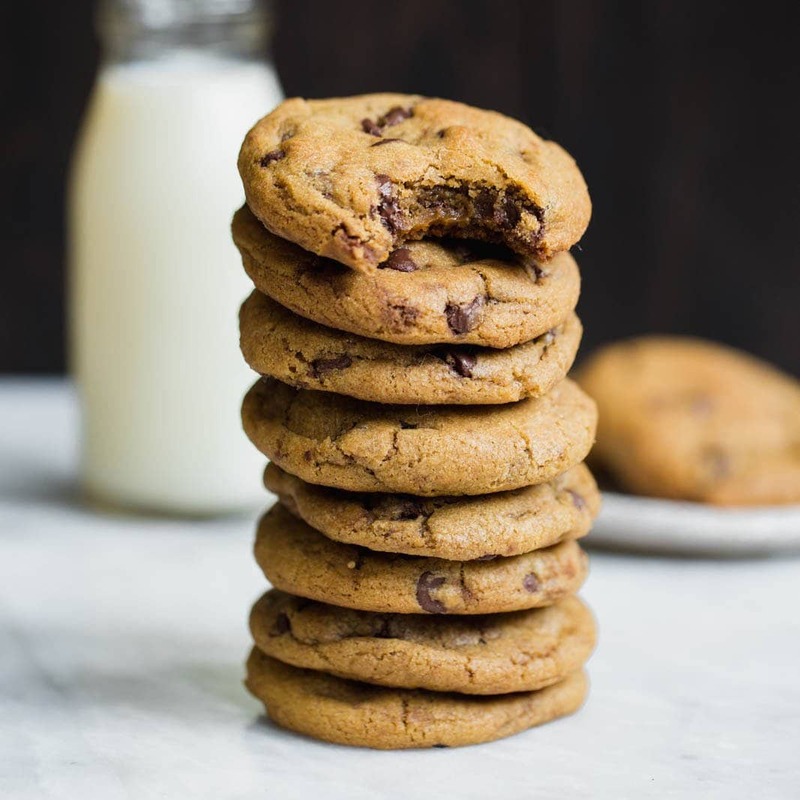 These cookies have my version of the ultimate texture combination: thick, super chewy, soft and a little gooey in the middle, crisp and slightly crunchy at the edges, with ooey chocolate chips throughout. Does anything get better than that? I don’t think so. I would want these cookies to be a part of my last meal on earth, that’s how much I love them! Do you remember my Ultimate Guide to Chocolate Chip Cookies Part 1 and Part 2? That is where I discovered ALL the secrets to making my version of the best chocolate chip cookie. This recipe utilizes half bread flour which lends chewiness to the cookies. It also uses a bunch of brown sugar which lends that butterscotch flavor and thick and soft texture. The extra egg yolk in this recipe also helps keep these cookies soft yet chewy and adds richness in flavor. You can think of the 24 – 72 hour chilling period as a “marinating” period. The flavors intensify and the texture will become thicker and chewier. It’s pretty amazing. Once the dough has chilled, allow it to sit at room temperature just long enough so that you can scoop it. The colder the dough, the thicker the cookies! I hope you make these cookies soon! If you want to watch me demonstrate how to make this cookie dough LIVE, with all of my scientific explanations, tips, and tricks, check out this live Facebook video I did a while back! See ALL of my chocolate chip cookie recipes + tips & insights into the SCIENCE of cookie baking here! This recipe was originally published October 2013 and recently updated with more baking tips and new photos. Photos by Constance Higley. These look AAAAMAZING! But here’s my question….. will they be as good if made in smaller size? (I don’t like to give kids such giant cookies.) And how do they taste a day (or two) after baking? See, I have found the NYT CCC to be fabulous – on baking day- but not so good a day later. You could definitely do a smaller size, just shave the baking time by a minute or two. They remain soft and chewy even days after baking, however I prefer freshly baked cookies still warm from the oven so I just freeze the balls of dough and bake them off as I want. 24 hours in the frig sounds like torture! How bad would it be to skip that step? I know it requires a lot of willpower but it really does improve the taste and texture!! You can skip it, the cookies will still be delicious. I would suggest you make the dough, bake off enough cookies to satisfy your craving, chill the remaining dough, then bake off the chilled dough to see if it makes enough of a difference for you to be willing to wait! I am wondering about the butter. Every time I try to make cookies with butter, they end up flat and too crispy no matter how awesome they look on the recipe photo. Yours don’t look flat at all either. This recipe sounds great but I am worried about the butter. Could I be doing something wrong? Can shortening be sub’d? Hmm it sounds like your butter may be too warm. The butter should be at a COOL room temperature. It should give slightly when you press your thumb into the stick of butter but not be super greasy and your finger shouldn’t be able to easily slide through the entire stick. If you follow this recipe, your dough should be relatively cold when it goes into the oven because it’s been chilled for a long period of time, this will help make the cookies thick. If you’d like, you can use half shortening half butter. Also avoid using cooking spray, that can cause the cookies to spread. Thank you! I think that I have used recipes that said melted butter and not room temperature. Maybe that was it. I really appreciate your help and am anxious to try these over the weekend.! Love loved your cookie experiment testing flour, egg(s), etc. and this one is a winner! My new go to. While my logical side can understand the refridge time, honestly, my taste buds didn’t notice enough of a difference to offset the mild inconvience-I had baked a couple out of the batch before putting them in the refridge. Has anyone mentioned a couple of the ingredient omissions in the instructions? A novice may have a challenge and not notice. Keep up the good work and love the test experiment postings! I want these so badly I could cry. I noticed you provided weight for some of your ingredients. I love in Australia and our cup measurements are different. I’d love to get the recipe exactly right cause it looks so fantastic. Would you be able to supply the weights of the ingredients? Hi Kikeena! I think beyond the flour weights which are already provided, you would only need to know that the recipe calls for 8 ounces or 227 grams of butter. I believe Australian and U.S. cup volume measurements are basically the same, perhaps a negligible difference. They’re gorgeous, Tessa! So many choc chip cookie recipes I want to try and this one is now one of them! Pinned! Chocolate chip cookies are my weakness! Cannot wait to try these : ) Thanks for the recipe! Any idea why my cookies aren’t cooking evenly? The outside seems to be browning but the inside is raw. The dough has been chilled. I even tried lowering the ovens temp. Seems like this happens with all my chocolate chip cookies! :-/ they taste really good though! Are you using a nonstick pan? Sometimes the dark coating can cause the bottoms and edges to cook quicker and even burn. I’m actual using a stone. Would that cause them to cook faster on the outside? I guess I will try a different pan with the rest of the dough. It’s possible. I would definitely try out a different pan! Also, you may consider investing in an oven thermometer. It seriously can make a world of difference to know what temperature your oven is actually at when baking! Thanks! I must say even though these are a little undercooked. They are, by far, the best choco chip I’ve tasted! Yay! I like my cookies to be slightly gooey in the center but if you prefer them to be more cooked, go ahead and add a minute or two to the baking time! Thank you so much for sharing this recipe! The cookies are heaven, soft & chewy in the middle but crunchy on the outside. A bonus: Huge & just the right thickness. I couldn’t wait for 24hr 😀 I baked a dozen for samples and froze the other two dozens in the freezer. I can’t wait until tomorrow. How can they be any better! Wish I know how to attach a picture I took of the cookie next to a quarter. I made some minor adjustment to the recipe. Instead of butter, I had used 2cups of room temperature organic coconut oil & added chopped pecans/walnuts & unsweetened coconut flakes. Thanks again for the sharing this WONDERFUL recipe!! I’m so excited you enjoyed the recipe. Good to know that coconut oil works! Thanks for your comment. Thanks for pointing that out – fixed! I never buy bread flour. Can it be substituted or will it effect the cookie?Thank you. I was also wondering about the bread flour, I had trouble finding that exact type of flour. Is this the same as pastry flour? Any suggestions for substitutions? It sounds like you may have over-beaten the butter and sugar. If you make cookies again, try to beat for 2 minutes, not a second longer. Beating the butter and sugar incorporates air into the dough and too much beating can make it light and cakey instead of chewy. Good luck! Your cookies look great! I can’t wait to try the recipe. Thanks for sharing. I think you’re missing a crucial word in your first sentence so I’m not entirely sure what you’re asking. To freeze the dough, shape the dough into balls, place on a sheet, and freeze until firmed. Then remove the frozen dough balls to an airtight container and store in the freezer until ready to use. I like to take out my frozen cookie dough balls and let them sit at room temperature for about 30 minutes before baking, adding on an additional minute or 2 of baking time. Thanks for your wonderful post! I’ve been trying to make the “ultimate chocolate chip cookies” for some time now but hasn’t gotten it right yet. But now, thanks to your post, I will try it again! My question is: if I’d like to add oatmeal to this recipe, but without altering its chewiness, how would you make your recommendation? I see a couple people have asked if there can be a substitution for the bread flour, I am curious as well. What is the benefit of using the bread flour, what could be substituted and in what way would the resulting cookie be different? I LOVE both tests! !……we need a 3 and 4th! !.I love chocolate chip cookies but i must watch my cholesterol intake ( doctors orders). I prefer cookies with a texture similar to the ‘ultimate chocolate chip cookies’ above and I always add walnuts. How can I accomplish this without sacrifizing texture and flavor too much. Less butter or fat, using spreads or margarine etc. Or less egg and egg replacement together etc. Thaks in advance. I am hooked on this blog,love the tips and comments from other people too. Thanks! You know, I’m really not a fan of nuts in cookies so this is something I don’t have much experience with. I think you’re heading in the right direction with lowering the fat content of the dough since the walnuts are quite oily themselves. I hope you get to experiment with this a little! Let us know if you find a good compromise. I’m always looking for a great CCC recipe. I’ve been using the one from America’s Test Kitchen (look it up) and they are phenomenal. I can’t wait to try yours, but I’m not a big fan of butterscotch. Your recipe is similar, except they melt the butter (almost brown it). I don’t do that, as it tastes too peanut-buttery for me. I just barely melt it. I also use 1/2 dark brown and 1/4 light brown sugars, not all 3/4 dark brown. Anyway, what makes yours taste like butterscotch do you think? You don’t melt/brown your butter and that’s the only thing I can think of that would lead to a butterscotch flavor. Hi Ed! The high proportion of brown sugar definitely lends some butterscotch flavor (in addition to moist chewiness) which is enhanced by the minimum 24 hour dough chill. During the time the dough is in the fridge the sugar can really dissolve and the butterscotch flavor develops. The chill also improves the texture. You might consider baking the dough right after it’s made or use a shorter chill time to avoid that butterscotch flavor. However, doing so may sacrifice some of the great texture. Hope that’s helpful! I followed your recipe & I’m hoping to have cookies like yours. I followed the NY Times recipe but my dough balls didn’t spread much for some reason & I had to use the back of spoon to flatten them since no one likes a puffed up blob of sugary bundle, LOL. I like my cookies the way yours are. Any idea why my cookies (following NY Times Recipe) didn’t spread much. THANKS! 1. Too much flour. Make sure you’re not packing your measuring cups with flour, spoon the flour into the measuring cup. OR better yet, weigh your flour. 2. Dough is too cold. Since I know that recipes requires the dough to chill, you may want to let it come to room temperature before baking so it will spread more. 3. Your oven is too hot. 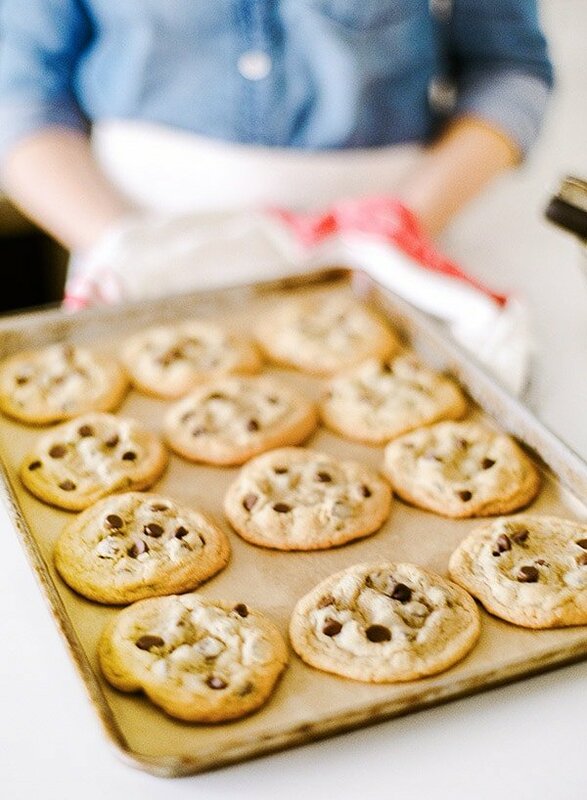 Cookies baked at a higher temperature spread less. Try using an oven thermometer to test your oven’s accuracy and adjust if necessary. Many ovens are off by 20+ degrees! You helped me a lot. I’m not a baker but love to bake & I learn from friends & net. Your blog is so helpful esp the video so that way I can get a rough idea how everything looks like when you blend & mix. Thanks again, I’ll let you know how my cookies turned out after 24 hrs chill. I’m hoping to have a wonderful result, I have tried many recipes & I’m not giving up esp after seeing your post & I had bread flour since I bought for NY Times CCC. Wish me luck! Your pictures are simply stunning. I made these cookies twice. Following the chilling in the fridge, temperature of the butter, using bread flour etc…. but somehow the cookies are not as chewy and soft as you have them. They get really puffy though and the inside texture looks very “bready” and crumbly. I wonder what i have done wrong. I baked them for 15 mins. Could I have overbaked them ? The taste was still great though, not too sweet. It sounds like you may have used too much flour. Be sure if you’re using volume cup measurements that you avoid compacting the flour into the cup – instead spoon the flour into the cup then sweep off the excess. OR better yet, use a scale the measure the weight of the flour (ounces listed in recipe). You may also try shaving a minute or two from the cooking time to achieve a more ooey gooey center. Hope that’s helpful! Thanks for the tips Tessa. I will persevere and try them again until they look like yours in the photo! Thank you so much for your lovely comment and for sharing your photo! I love it!! I’m so happy everything turned out well in your German kitchen. Yay! I tried this recipe last weekend ! It makes 20 cookies with me , however they were the BEST COOKIES EVER! Thank you so much for sharing this AMAZING recipe. OMG that is exactly how I like my CCC!!! This is THE recipe! I’ve found many recipes only focusing on texture but paid no attention to the gooeyness or flavor of the cookie. THANK YOU SOOO MUCH!! And what do you mean by culinary grad? Does that mean you went to a culinary school? YAY!!! Love this comment 🙂 And yes, I went to culinary school. Yes you can, though the bread flour really helps make these cookies chewy and wonderful. hi…. my dough before it went into the fridge is really soft and gooey like. is that ok ? Hey, my cookies have come out of the oven and they are quite thickm and puffy. Also once they have cooled down, they are still really soft, like it is a cake texture inside inatead of a cookie. What should I do ???? Were the cookies still hot when you tasted? They’ll get chewier as they cool. It sounds like you may have over-beaten the butter and sugar… this recipe is definitely not cakey! can you tell me what weight is 2 sticks of butter please?? Also is all purpose flour plain flour?? What is your favorite brand of chocolate chips? Just made these yesterday. They are the best chocolate chip cookies ever! I will throw away my other choc. chip recipe. 🙂 Thanks! O.M.Gee! These are the best chocolate chip cookies I have ever tasted. I made the dough yesterday to let it refrigerate overnight. I made the cookies today. These are amazing! Thank You! What would you change for a high altitude version, I am at about 5000 feet above sea level. Thanks! Can not wait to try these!! Hi Robert! Unfortunately I’ve lived in Phoenix for most of my life and have no experience with high altitude baking. All I can really offer you is this resource to adapt the recipe: http://www.kingarthurflour.com/recipe/high-altitude-baking.html Best wishes!! I just made them and they were delicious, but a tad too sweet. I was wondering if I could lower the amount of sugar and still achieve the same crisp edge and chewy center. Have you tried lowering the amount of sugar? Thanks, this truly is the ultimate chocolate chip cookie, the best I’ve found. The sugar definitely helps to create the lovely texture. I haven’t tried lowering the amount, but you might be able to get away with reducing it by 1/4 cup. Reading your three part series has been such fun & a great learning experience. Thank you so much for your hard work. I read you are not a fan of nuts & have not worked with them. I still want to ask as I love nuts. Would you alter the recipe to accommodate? Thank you for all the hard work with experimenting with the different variations in your 3 part series. I happen to prefer my sweets with a bit of a salty disposition. So I usually add 20-30% more salt while using a larger crystal, ie kosher vs fine crystals. Because of the size of the crystal the cookie itself isn’t salty, rather you get bursts of salty goodness as you chew. Additionally, I find that the extra salt actually quenches my sweet tooth faster so I am less likely to overindulge (not that there is anything wrong with that!). One other variation I do is use brown butter. Most recipes I have found that use it call for it to be in a cool but liquid state (probably for time sake). I like to chill my brown butter in the fridge for at least 6 hours to let it re-solidify and I use it like regular chilled butter that is then softened and creamed with the sugar(s). I find that you get a huge dose of caramel, toffee and butterscotch flavors from this while maintaining the texture you get with chilled butter (vs melted butter). I have tried your recipe and it is one of the best I’ve had. Again thank you for the time you took to step through all those iterations. My next task is to try your recipe with my variations! 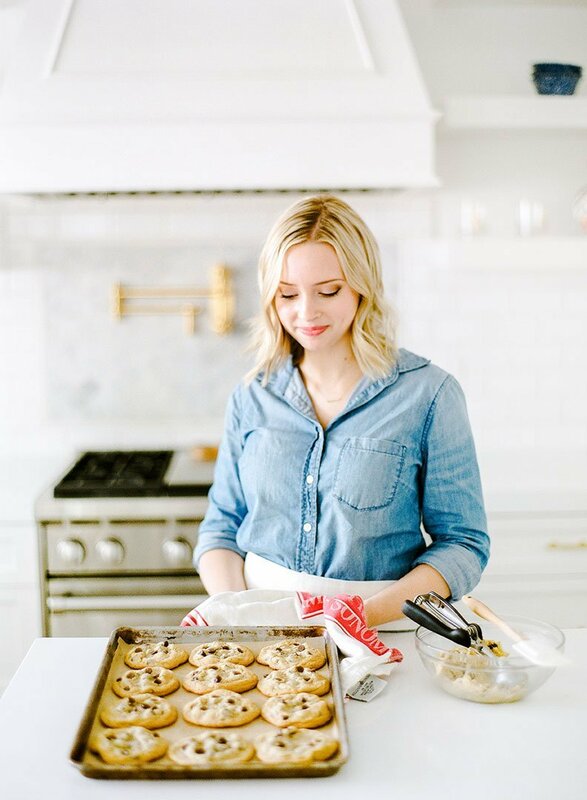 Thanks for detailing your experiences with cookie baking! Love the browned butter. I haven’t done any specific testing with store brand vs. premium butters for cookies but have used various brands and haven’t noticed enough of a difference to make it worth spending the extra money on a premium brand. The difference is more obvious in other recipes (cakes, frostings, etc.). HI Tessa! What kind of cookie sheet do you use? I have some air-insulated sheets and I am wondering if they are helpful or harmful to the cause of making great cookies. I am going to invest in a Silpat non-stick mat, and want to make sure that while I am making that upgrade, I am using the right kind of baking sheet to try out your gorgeous recipe. I would love to add/incorporate peanut butter to this recipe, any suggestions? Best cookied ever! Thanks so much for sharing. Have you ever made these cookies into ice cream sandwiches? Do you know if they freeze well? I’d assume with the softer texture they’d be perfect, but would love your thoughts. Thanks Michelle! I actually have a specific chocolate chip cookie recipe from my cookbook that I use for ice cream sandwiches, but these would be great too! I made these last night for a friend. I had to make a lot so I doubled the recipe. I waited about 12 hours before I cooked them. But when I did……. Oh my goodness. These are the perfect chocolate chip cookies! I also agree that The bread flour is a must. Thanks for sharing such a great recipe. Thank you so much Audra! I’m so glad you enjoyed the recipe. I would love for my cookies to turn out the way yours did. I want them to be flat, thin but chewy and to spread. Can you please give me some insight into the recipe i used and why my cookies turned out so puffy and didn’t spread? Your expertise will be greatly appreciated. Interestingly enough the recipe I used was titled “perfect chocolate chip cookies”. I just have to say thank you! I don’t generally comment on recipes, but these were absolutely, positively perfect. It will be my go-to cookie recipe for years to come. It was everything I’d hoped for and more. I bake a lot, and always look for the ONE recipe that I can write down in a safe place, and keep going back to. This is THE perfect chocolate chip cookie, the one my kids are going to grow up eating. Thank you, thank you, and thank you again! Thank you so much! I’m thrilled to hear you love the recipe. I’m not sure what’s available in Brazil but you can use regular all-purpose flour, or any kind of higher protein flour. I LOVE chocolate chip cookies but I have high cholesterol same time. Is there any way to substitute butter with any none cholesterol oil. I understand quality will not be the same but I take it any time for not having chocolate chip cookies at all. We’re all wondering if that could possibly be correct! Can you offer any clarification? I’d like to make the cookies in the photo labeled “both”. I don’t know what “both” means, can you help? I enjoyed the Ultimate Guide Pts 1 & 2, and I have actually included them in a 9th Grade Chemistry unit on the Chemistry of Cooking. The kids usually go home and try (or have mom try) the version they think they would like the best. I’ll have to try this recipe, but so far my favorite is your melted butter variation. If I want to make those flat ‘both’ cookies, do I follow the ultimate cookie recipe and just add the’both’ segments of baking soda and baking powder and just not put in the refrigerator for 24 hours? Or what? What about chilling those? Thank you. Jackie – it means both baking powder and baking soda. Click the link right under that photo. Good luck with your future cookie baking April! Can the dough be rolled into balls and freeze? So can make them whenever needed? Yep, I mentioned freezing briefly in the post. I always use unbleached when possible 🙂 Happy baking! I made the cookies exactly as your recipe states and my cookies turned out like the “more flour” picture. Any advice!? I don’t have anything to weigh the flour, so I was not as accurate as your video. I do have an oven thermometer? The cookies were still very good. This recipe is perfection!! I made a batch for a girl’s weekend recently and they were a HUGE hit! I’m actually going to use this recipe for an upcoming friend’s wedding in a couple of week for her cookie bar. Is there any way you could tell me about how many inches a 3 tbsp scoop/ball of dough makes? I made 2 tbsp size when I made them, but I’m trying to plan for the approximate size so that it fits best in our bags. Thanks for a wonderful, yummy recipe!! There is nothing better than cookies! Woohoo!! I’m not 100% sure, though I’d estimate at about 3 1/2 inch diameter for 3-tablespoon dough balls. Will run out and buy bread flour today! These sound perfect! I searched the blog for a peanut butter cookie that would be crisp edges and chewy in the center, I didn’t find any. Is that in the plans? And the cookie in this ice cream sandwich recipe: https://www.handletheheat.com/peanut-butter-cup-ice-cream-sandwiches/ (these are quite soft and chewy though). I just might have to experiment more with peanut butter cookies! I can’t figure out what I’m doing wrong. Did the recipe exactly and still got cookies like ALL my cookies turn out – as if I used melted butter. Great flavors, but all run out and crispy. This has been happening for years and I can’t figure it out!!! Oh that’s so wonderful to hear!! I’m thrilled you love the recipe. Thanks so much for your comment. Hi, I just put in COARSE sea salt instead of FINE. So the cookie has chunks of salt in it.. I made the batch to give it as a thank you gift for my recommender. Is there anything I can do about this?? I think it should be fine, maybe just a little bit salty here and there. Baking mine at 375 has made all the difference!! 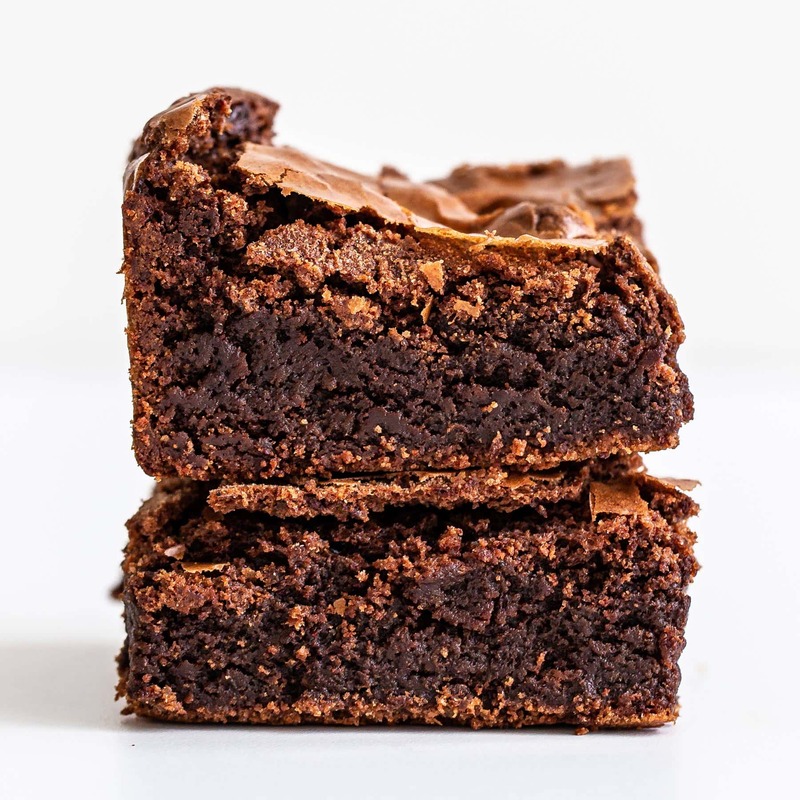 I love the butterscotchy and crisped brown sugary texture…the flavors are just right! Would there be a spot for Tenderflake in a cookie?? Or is that all about pie crust? hi, i was wondering, if i do not want to bake all the cookies on the same day, what do i do to preserve the cookie? 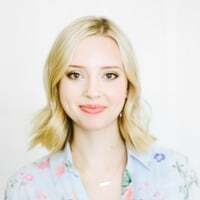 Hi Tessa, Thank you so much for such a great sharing. Could you please provide the recipe in grams? I was trying to do the conversion myself but there are so many conversion formula out there and they are all different. Thank you! Bless you. You sure are patient with commenters who don’t read the recipe fully, or make their own substitutions and wonder why their cookies aren’t just like yours. What do you mean by two sticks of butter ? Could you give a measurement instead.. I don’t use sticks . Thank you! I have not tried to transform this recipe into a double chocolate chip cookie one but you are definitely on the right track. Whatever you do, just know that adding in cocoa will change the composition of the cookie dough and will basically always make it slightly more dry and crumbly than a regular chocolate chip cookie. This was a great cookie. I also added 2 tablespoons of cream cheese when creaming the butter and sugar. I read on King Arthur that it could help make sugar cookies more cake like so I decided to try with the chocolate chip! Do you have any suggestions as to why else it might be? Thanks so much for sharing your love for baking with all the cookie lovers in the world!! Your knowledge and level of care is truly appreciated! I always come back to this amazing chocolate chip recipe!! Hi Tessa! I’m from the Philippines. I know that info is not too important but I would like you to know that your Ultimate CCC reached the SE side of Asia. That’s how good it is! you’ve done it. finally i have found the recipe for chocolate chip cookies that i have been searching for pretty much my entire life. These are perfect. i just cannot thank you enough – my pintrest is filled with pinned recipes claiming to be the perfect cookies, to no avail. here you were this whole time! thank you thank you thank you!! i only adjusted slightly for the ingredients I had on hand , and they were perfection to a T.
What an incredible comment Danielle! Thank you SO much I am so thrilled you love the recipe. Wow what an incredible comment!! Thank you so much!! I just made these cookies and they are absolutely divine!! I had to bake them longer at 20 mins at they were still very delicate to lift at 15. I also noticed that my cookies have a much more golden brown colour to then. They’re not burnt in any way but just look a lot more golden. I also noticed that they’re really quite greasy. I put 2 sticks as listed but maybe the sticks here (canada) are a bit different than American ones? What could I do next time to make them less greasy and maybe less golden looking? Hi Gilian! Glad you enjoyed the cookies. 2 sticks of American butter = 8 ounces or 227 grams. Not sure how that compares to Canadian butter sticks but I’ve edited the recipe to include this for non-US bakers. I would try lowering the baking time to what the recipe states if you give the recipe another go, they will continue to cook with the residual heat and by the time they are more cooled they should be solid enough and not too browned. Oh I forgot to mention that I didn’t have bread flour on hand and instead used whole wheat pastry as the protein contents are quite similar. Could that contribute to the darker colour? Does bread flour absorb more of the fat from the butter and that’s why I find them to be kinda greasy? They still turned out lovely anyways with the whole wheat pastry flour. Nope I don’t flatten, they should spread on their own. If they don’t spread you could be over-measuring the flour. I would also suggest following the baking time recommended by the recipes, cookies may LOOK undercooked in the middle when you take them out of the oven but will continue to cook from the residual heat of the pan. This way the middle is perfect, slightly gooey, and the outside is crisp but not hard. Happy baking! I’m sorry I thought I read a response to this question earlier but I couldn’t find it now that I am “in process”. I would like to make medium vs large cookies. So maybe 2-tbs balls, and approx 36 cookies….what do I need to do for baking time and/or oven temp accordingly? Thanks so much!! these are hands down the BEST cookies i’ve ever made. my goodness. i usually tweak recipes (in fact i find it hard not to) but these were just absolutely perfect. Linked to this article on our site, classesncamps.com We are definitely going to play with this during break. What yummy experimentation! Thanks for the amazing recipe! Can’t wait to try this. Just wanted to check if you recommend Light or Dark brown sugar or a certain brand. Thank you for this amazing recipe. I have tried different recipes over the years, and nothing compares to the taste and texture of these. My children and their families have sung these cookies’ praises and begged for more. Great, I am 70 years old and have finally learned how to make chocolate cip cookies. This recipe is great! My husband says it’s better than his mom’s – which is quite a compliment! I want to make this – but as a cookie cake – for my daughter’s birthday (Feb 14). Is this possible? I’ve scanned all the comments and don’t see an answer for my question. Thanks! I’m not one to post comments, but this is the best chocolate chip cookie recipe I’ve tasted! They are named appropriately! One thousand thank you’s from my family to you! I had a few nuts left from various recipes, so they found a home in the batter. Macadamia, walnuts and pecans added a nice touch. Just found your site and Really love it. I did want to say I have been making Chocolate Chip cookies for years following the recipe on the Nestles Toll House bag, but for some reason, probably out of brown sugar, I switched it with the same amount of Powdered sugar and they come out really nice and soft and puffy and no brown edges etc. I will certainly check out more of your site. Hmm interesting question. Yes, the majority of American baking powder is double acting which means it is activated once it touches the moisture of the dough and again, and more powerfully, when it is heated by the oven. Single acting baking powder is ONLY activated once it touches the moisture of the dough, which means that after the chilling period of the dough called for in this specific recipe that the baking powder will basically have lost all its leavening power and will be useless. So yes, if you can use double acting baking powder that would be best! Good luck! I have been constantly trying to make the perfect chocolate chip cookies for a long time now and today I did – all thanks to you! I couldn’t find any bread flour so I just used all-purpose for the whole recipe and I added some MnMs with the chunks of Cadbury chocolate. They were a huge hit! Perfect texture, chewiness, size and softness. Thank you so much. My cookie cravings have found peace. Can I add nuts to the recipe?? These are really good but your browned butter toffee chocolate chip cookies are the real ultimate cookie. I’m baking them with a 1.5 Tbls cookie scoop and in a 325 convection oven..can you help me with the baking time please. Hello, after refrigerating the this recipe dough overnight or for a few days, does it loses leveaning power?? Or the texture results will be the same always? Comparing to baking right away. I made yesterday your brown butter choc chip recipe, but I creamed the butter instead of melting, and baked right away some cookies, they came out perfectly, puffed up, crisp around the edges and with a perfect texture i never achieved before! Texture was so good, it wasnt greasy, it was literally perfect. I freezed the dough and tried it today to see if it would be the same, but it wasnt :/, the cookie came thiner and it was more dense, i tried with very cold dough and room temperature dough, on different oven temperatures and it didnt come out like yesterday. What happened?? The leavening power from baking soda stoped working because of the resting period? And would it happen with this ultimate choc chip cookie recipe? Immediately after making the dough, can I form into balls BEFORE chilling for 24 hours? I want to make sure this doesn’t dry them out. Thanks! No, it works best to chill all the dough together. Think of it like marinading. All the flavors need to meld together and we don’t want to dry the dough out like you mentioned. Does bread flour changes the flavor of the cookies?? I started using some kind of bread flour (in my country theres no bread flour, so i just bought some higher protein flour with aditives found in US bread flour, like ascorbic acid and other things). Here most flours dont have that stuff. And the cookies came out with better texture, but there was something off with the flavor! Like its missing sweet/vanilla flavor. Im using artificial vanilla, 200g butter instead of 226g (one stick here is 200g so its easier to use that), and im using little extra flour because the flour here is not very good compared to US flours, its weaker. So what could be the problem? All that combined or its the flour quality? Because before using that new flour, the flavor was there, it was good. These were the best chocolate chip cookies EVER! My family and friends said the same. I added white chocolate chunks and they were delicious. Thanks! Hi Tessa ! Thanks for sharing your wonderful recipe !! I wonder what is the right type of white sugar used in your recipe. “Refined” is the most used, is a highly refined multi-purpose sugar and the “Crystal” has a larger grain. By the way, what is the effect of using superfine (like caster sugar) or a slightly larger grain sugar in a cookie recipe? Hi Alex! Refined looks like what we call granulated sugar here, which is most commonly used in baking. Superfine / caster sugar might produce a finer more delicate texture. I’m not sure about a larger grain sugar as I’ve never baked with something like that. Hi Tessa, What will be the difference if i will not be using bread flour? will it taste the same? Amazing!!! 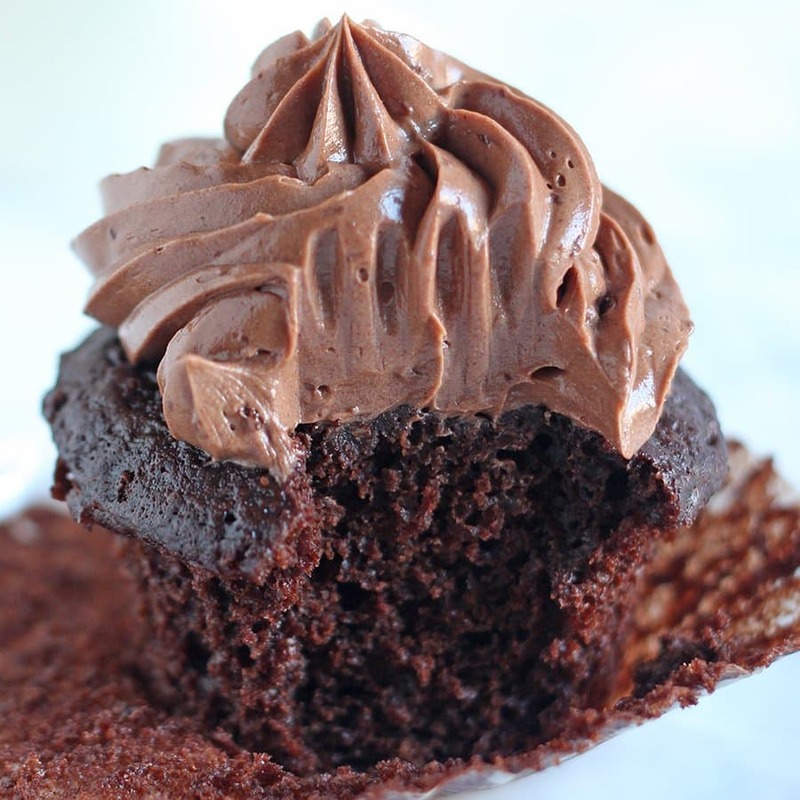 perfectly chewy and oozing chocolate goodness!! the waiting killed me but as you said makes all the difference! Thanks for the recipe. I appreciate the the time and effort you put into it. Just one thing though; your grams are off. So the questions is; should we follow the cups or the grams when making the recipe? Hi Melissa! Weight measurements will vary slightly depending on the brands of ingredients used and the publication itself. Always follow the weights provided by the author because those were used to test the recipe. Some brands of bread flour may be SLIGHTLY heavier than AP flour, but in my experience only by 1 or 2 grams. I’ve tested this personally. That’s not enough of a difference to complicate measurements for in my opinion. As for the sugar, it depends on how heavy you pack it into the cup. Again, following the measurements provided by the author will yield the best results from any recipe. Hope that helps! I Finally got around to making the cookies. They taste great and look great!. I have tried so many CCC recipes and many have tasted good but never looked right. These are visually appealing and not too sweet. This will definitely be my go to recipe. Thanks for posting! You had me at chocolate chip! Thank you so much for all of your elaborated recipes! they are wonderful. I have one question – since I don’t have a ‘scooper’, could you please write down for us how many grams are in a pre-baked chilled dough ‘scoop’ (“3 tablespoon sized ball”)? Hello! These sound like they are amazing! However, I am a “crunchy” cookie lover. Would I simply just bake them a little longer to achieve that, or adjust an ingredient? Thank you, and can’t wait to try the recipe! After making a disastrous batch of cookies I decided to try your recipe !!!!!!! What can I say simply delisious !!!!!! Kids looooved them Hubby loved them…. This will def be my go to recipe from now on! Thank you for sharing and thank you for the super easy instruction and video! Keep the great recipes coming! These cookies are AMAZING! Absolutely love the butterscotch/ buttery-toffee flavor. I always bake with extra brown sugar and less granulated sugar, but the substitution of some bread flour with the AP flour gives the best texture. This will be my go to cookie recipe from here on out. Thanks for sharing all your research. You are awesome! Do you have any experience with making the cookies with less sugar or maybe Coconut sugar instead? Also can these be made with spelt flour? I haven’t tried spelt flour particularly, but half whole wheat flour works well! Anytime I’ve reduced the sugar I get a drier texture so I haven’t had much luck there. I would love to try your recipe! May I know how long are the shelf life of these cookies? Will they last for more than 2weeks if they are wrapped in plastic and giveaway boxes? Fresh out of the oven, wish I could add a picture for you! I cheated a bit and only chilled for about 6 hours. I just simply ran out of Tim every to get them started. They are perfect texture. I ha don’t to fiddle with the time a bit and one pan is over cooked but still taste amazing! Thank you! I’ve always experimented with recipes and combos of ingredients. How does using salted vs. Unsalted butter make a difference? Fluffiness? Love love love the recipe….even though I found I had salted butter and wheat flour! The bread flour and egg yolk really help. This is the recipe I used already with two exceptions. Brown and granulated sugar 3/4 cup each. Cut vanilla to 1 tsp and add 2 tsp vanilla butternut. Try the vanilla butter and I’m sure you will agree that this is the new ultimate cookie. I did try bread flower and it made the cookies even better. I love your recipes. Keep them coming! Recipe looks great will try today, but I just had to comment…. finally, a baking article with photos of a well-used baking pan! I am excited about trying these. Was wondering, though, if I use all all-purpose flour, do I substitute the same amount for the cake flour? I noticed that the flour amount in this Ultimate Chocolate Chip Cookies Recipe is increased by 1/4 cup of the basic cookie (recipe base) you have on your website (when doubled). No cake flour here!! I’m not sure what you’re referring to? I’m not sure offhand since I’m obsessed with my OXO cookie scoop, but you could always weigh out the entire mass of dough, then divide it by 24 to get the ounce per ball 🙂 Can’t wait to see your photo! Hi Tess I’m a Brit living in Italy and I’m going to make these this morning just in time for the weekend breakfast’s and if they come out right and I don’t mess up your recipie I’d like to enter your competition for these cookies and post them on Istagram !!! I have a grown 54 y.o. son who won’t drink milk unless he has his chocolate chip cookies to dunk. So I make these cookies at least once a week. Follow her recipe to the letter. Take no shortcuts. I guarantee that you will not be disappointed. Even my 54 y.o. son agrees with me. Ignore the recipe on the back of the package of chips. One time I made these and all I had on hand was dark brown sugar. I will never go back to regular brown sugar. Due to the extra molasses in the dark brown, it gives the cookies more depth to the flavor. I have three sizes of dashers (ice cream scoops) and make two sizes of these cookies. My son likes his small so they fit in his glass of milk for dunking, The rest of the cookies go to my daughter and her sweet tooth husband. Hi I can’t wait to bake these cookies, it sounds like the perfect cookie and after all these years of me trying to find one you’ve done it! Also is an electric mixer crucial to this recipe and getting them how you want? I believe it would be, but I thought I’d ask anyway to see if you have just tried just hand mixing? I have a great chocolate chip cookie I have been making for years, always to great reviews. I didnt think another cookie could come close. I was wrong!, I made the cookie dough Sunday morning and baked about 1/4 of the dough last night, they were so good! crispy on the outside and gooey/chewy on the inside. It wont replace my other recipe, however this recipe is on my rotation now, Thank You! The taste is perfect! I love how the cookies turned out not overly sweet like other recipe, unfortunatey the texture of my cookies I baked was not like yours 🙁 and I dont know what I did wrong I read the whole article and tried to follow all your directions but still my cookies were hard, puffy, crumbled, and not spread as wide. I want to cry it is so frustating that I tried so many batches and still failed. Sorry for my bad grammatical English, I hope you understand. It definitely sounds like too much flour was used. Did you measure the flour by volume with measuring cups or by weight? Im a French food lover who are seeking the best and authentic american receipest! I had the occasion to try your ultimate cookie receipe. They were good at their full effects! By any chance, is there a way to decrease sugar levels of your receipe? Some of peps find it a bit too sweet. My family having diabetic history Im looking for keeping the same receipe by decreasing sugar levels at its minimum and preserving the “chewy heart and crispy edge” effect. I hope you will have an answer for my issue. You may be able to reduce the sugar slightly, but it provides more than just sweetness so the texture will likely be affected. I haven’t tried so I can’t say for sure! Thank you so much for this recipe! I use kosher salt instead of sea salt, and milk chocolate morsels instead of semi sweet. I love that they have almost a salty tang, and then the chocolate chips hit your tongue, and it’s the perfect little bite. My daughter requested these for her birthday treat at school, and all the teacher wanted the recipe. So delicious!! I have been on a quest…not unlike Indiana Jones on the Quest for the Holy Grail…a quest for over 25 years for chocolate chip cookie perfection. Every cookie I’ve made, no matter how others describe it or what the picture looks like, turns out round and cake-like…not my thing AT ALL! Well tonight I proudly walked downstairs and told my husband that I had FINALLY done it…I had found that which I was seeking…the PERFECT chocolate chip cookie recipe. It is crispy on the edges and has just the right bite and chew in the middle. I’m actually not sure that I can tell you how happy I am! I have pinned your recipe half a dozen times and every time I looked at it I asked myself, “What difference will cake flour make? and an extra egg yolk? Don’t bother, you’ll just be disappointed.” Well, I’m so glad that I finally did it! Thank you for guiding me oh wise one! So now, the question is, do you have a similar type outcome in an oatmeal raisin cookie? I have the same problem with those! Oh my god, this is the best blog comment I’ve ever received!!! Love this!!! I’m so thrilled to hear how much you love the recipe. I want to try this recipe, but it asks for bread flour and I’m not really sure what that is lol. I live in brazil and I don’t know if we have that at all. Would it change too much the quality of tge cookie if I used only the normal flour? Well, I didn’t hesitate to buy your handbook now that I know that you have an Ultimate Raisin recipe too. If it’s anywhere near as good as the chocolate chip cookie recipe, then that recipe alone is worth the book cost! I bragged about the cookies on Pinterest and had a number of the teachers at my high school claim that they are “scientists” and would have to sample to know if my statement was true. Well, the number of e-mails that I got about those cookies was unreal…I was all levels of popular at work that day. Thanks again Tessa! If I freeze the dough, do I still need it to be 24 hours in the refrigerator then scoop it before freeze?? Can I use white chocolate chip and macadamia nut instead in this recipe to make white chocolate macadamia nut cookies? By far the best chocolate cookies ever! Thank you for sharing. Hi Tessa!! How long can I keep the dough in the freezer?? Your recipes are amazing!!!! Can these be frozen once they are baked? Last night I made this recipe. Omg. I love your chocolate chip cookie recipe. I will use his from now on. I made this recipe exactly the way you suggested. Only thing, after making this dough, I made six large cookies. Put the rest in refrigerator. I just couldn’t wait. This is my new chocolate chip cookie recipe. I have tried many. I would rate this recipe 19 stars! Why use granulated sugar at all? Is it necessary? I feel like I’d prefer the taste with all brown sugar, but would that wreck it? Made these for the first time today. All I can say is that I have found my new go to recipe for chocolate chip cookies. (It only took me 50 years)! These cookies are Delicious! Great flavour & easy to make. I always make a double batch because they just don’t last! I’ve been such a fan of this recipe and have been using them as my go to during parties or as presents. Why can’t the dough be used after 72 hours in the fridge? I noticed your coconut oil cookies require cornstarch but not the ultimate or bakery style that use butter. However, when baking the skinny cookie which also uses coconut oil, you don’t use cornstarch. Just wondering if there was a specific reason for this? Everyone adored the coconut oil cookies so I was going to make the skinny version but don’t want them to flatten too much as tends to happen with oil. Hi there, these look good! I was just wondering if you use pure vanilla or imitation on your recipes? Can’t wait to make these! Is there a way to print the recipe from your e-mail? I live at high altitude, 5000 feet, and make NO CHANGES to the recipe. The cookies always come out delicious and perfect. 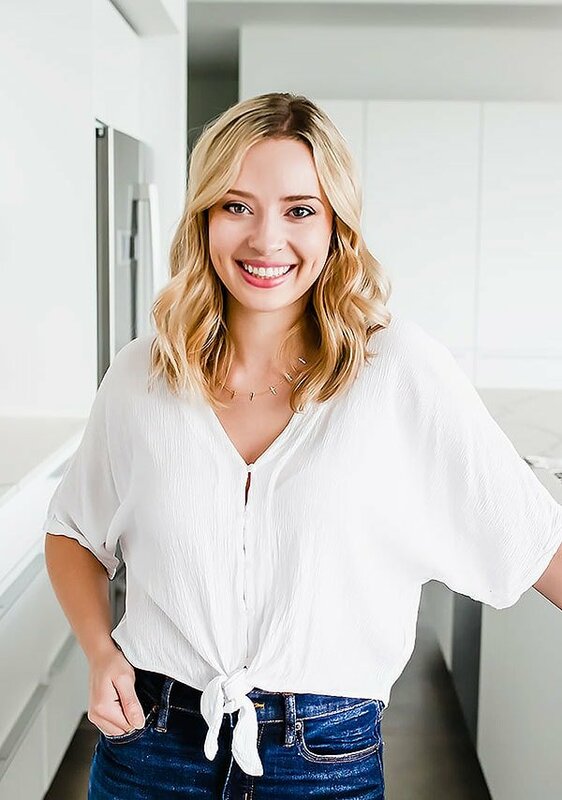 I want to thank you Tessa for also adding the gram measurements, I always weight my ingredients to get the perfect cookie. Also, I want to thank you for all the hard work you put into your “Ultimate Cookie Guide”. I found a couple of things I was doing wrong and have since been baking with great results. These are amazing. The world’s best recipe. Follow the recipe to a tee (read the whole recipe and all notes first). I beat by hand and they turned out fine. I’ve had and made many chocolate chip cookies in my day and these are by far #1!! Instead of putting dough in fridge for 24 hours, can you put the dough in the freezer for a lesser time? Hi there! I followed this recipe to a T and my cookies came out completely flat. What did I do wrong here? Best choco chip cookie recipe out there! I’ve tried at least 10 different ones and this by far blows the others out of the water. Thank you so much for sharing!! This has become our holiday go-to recipe for Chocolate Chip Cookies. It’s simple, works great each time, and satisfies both the soft and crisp cookie lovers. I have not baked cookies for several years. Largely due to the lack of success I had with them – too flat and oily or too hard. When I read the description of your Ultimate Chocolate Chip Cookie, and most of all, your excellent instructions and tips, I knew I had to give it another go! Tessa, thank you! These cookies first batch turned out perfect, so unbelievably good tasting, thick and chewy with crispy edges! Yum! 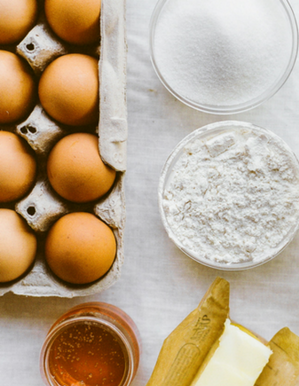 Your tips of weighing the ingredients, chilling, using an oven thermometer were keys to success! (My oven was off by 30F!) I am now back and enjoying baking thanks to your excellent tips and recipes! 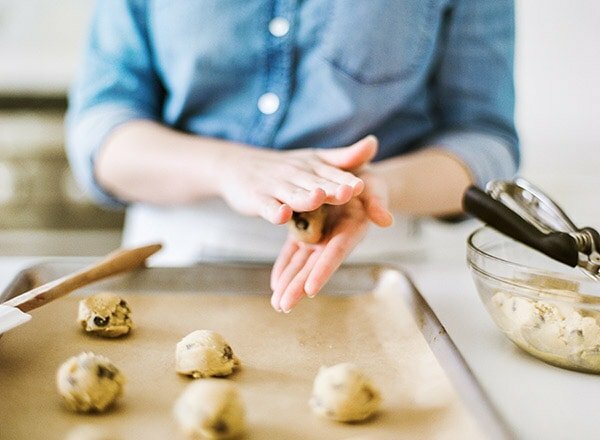 Your recipe has been our family’s go-to chocolate chip cookie recipe for at least 4 years now. Thank you so much! 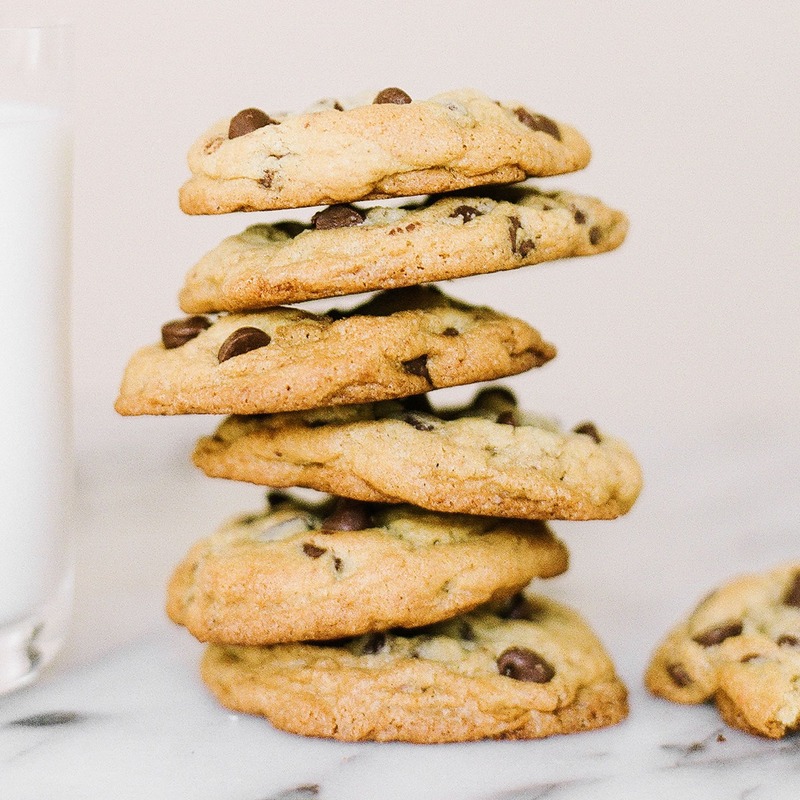 I don’t know if you already know this, but your recipe is very similar to Jacques Torres’s famous chocolate chip cookie recipe! Our family has been watching the show “Nailed It: Holiday” and Jacques had a very short video for his chocolate chip cookies. When the ingredients flashed on the screen, I immediately recognized he used both cake flour and bread flour, like yours. I looked it up, and it’s nearly identical, and he also recommends chilling the dough for 24 hours. I KNOW you didn’t copy his recipe, this page has been up for over 5 years, and the page that shares his chocolate chip recipe just went up this year in 2018. (https://www.brit.co/chocolate-chip-cookie-recipe/) You did all of the lab work yourself, and created this recipe on your own. I just thought it would make you feel good to know that you came up, on your own, with the same approach to chocolate chip cookies that a world-renown chocolatier did!! I know you’re already very successful, but I always appreciate hearing that I did something as well as one of “the greats!” I think this is awesome, congratulations! 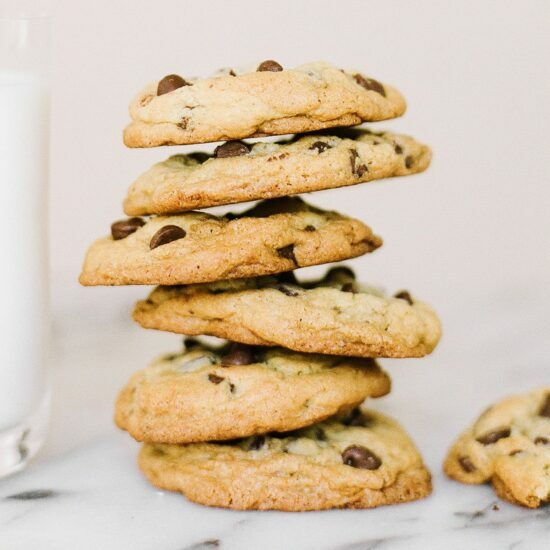 So, now, in addition to telling anyone who likes our family’s chocolate chip cookies to check out your site, I’m going to tell everyone I know that your recipe is like the famous NYC chocolate chip cookies – you are THAT good, and they should check out your page! How many ounces are equal to 191 and 159 grams? I love all your recipes and every single one I’ve tried has come out delicious. I was wondering why 1.5 cups of all purpose flour on this recipe is 191 grams of flour but only 187 grams of flour in the toffee chocolate chip recipe? I follow all your recipes by weight. I don’t think it makes a huge difference because the cookies still came out delicious. I wasn’t sure if it was an error? Thank you. Hello! I just like my cookies to be sweetless. How much can i reduce the sugar?